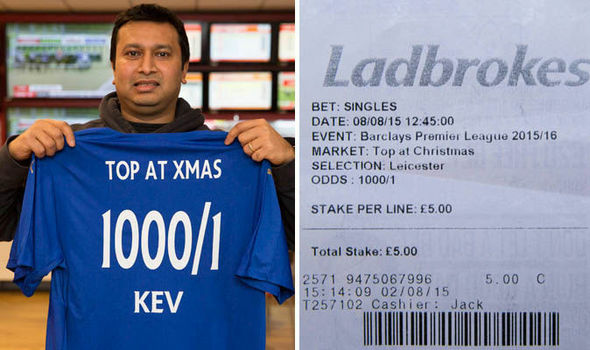 Leicester fan in huge cash out – fool or genius? Leicester City continue to surprise everyone by remaining top of the Premier League table, but as it enters squeaky bum time, some fans are starting to have doubts. We saw earlier in the season how a Foxes fan netted £5,000 on a bet to have them top at Christmas, but now we are seeing some large windfalls from crazy loyal smart fans. After reading about another fan who cashed out for £29,000 on a 5,000/1 bet on Leicester City winning the Premier League, another anonymous fan has decided to do likewise with Ladbrokes and has raked in the cash. The anonymous fan, stood to win £250,000 after putting £50 on Leicester City to win the league at 5,000/1 at the beginning of the season, but has instead decided to settle for a cool £72,335.89 instead. Done before today’s results which saw Leicester gain 2 more points on their rivals, the question is, are they a fool or genius? What would you have done….? Next Post: Get in the mood for UFC 196 with this great animated video.